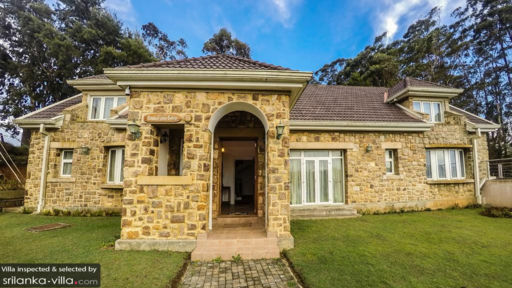 Welcome to Cotswold Stone Cottage in Nuwara Eliya, central Sri Lanka. Located within the gated Little England Cottages community, the four bedroom property features a sun-soaked outdoor terrace, picturesque garden and spacious living area. Ideally kitted out for travelling parties of eight, the villa makes a great getaway for a relaxing vacation with friends and family. The villa features two deluxe king bedrooms, a deluxe double room and a twin room. Each of the rooms are outfitted in a soothing colour scheme, quality linen and block out curtains to facilitate rest and relaxation. The well-appointed bathrooms are light-filled and spacious, and are equipped with toiletries from luxury Ayurvedic spa brand Spa Ceylon. Extra beds may be set up at request. 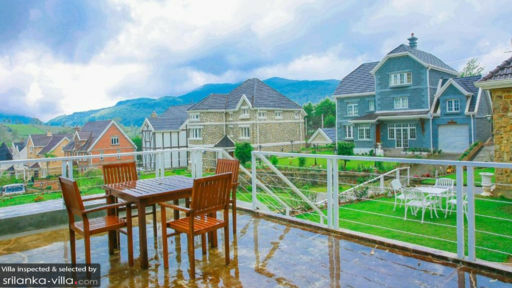 Step out to a spacious, neatly manicured garden with views out to the villas and mountains. Relaxing upon the daybed as you take in the fresh mountain air, or taking a stroll across the grounds are some of our favourite ways to unwind outdoors. A dining set can be set up at request for an alfresco dining experience under the starry evening sky. The common areas are beautifully appointed, with carpeted floors, cream coloured walls, plush leather sofas, elegant wooden furnishings and a fireplace. Air conditioners keep the interiors cool during the warmer months of the year, and the rooms are equipped with Wi-Fi and flat screen TV for entertainment. A games room comes equipped with a pool table, board games and puzzles. The property offers round-the-clock security service, daily housekeeping, grocery deliveries, airport transfers, shuttle service, car rental and bicycle rental. Alfresco dining, in-room dining and kids meals are available at request. Your villa manager will also assist with off-site activities like horse riding, hiking, canoeing, golfing and playing darts. 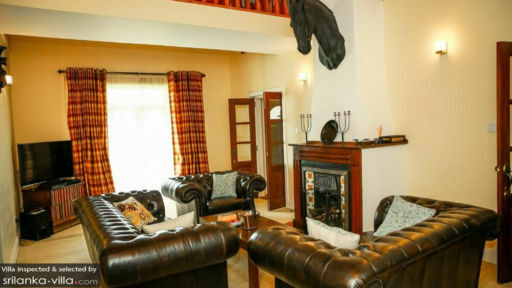 Cotswold Stone Cottage is located in Nuwara Eliya, a city in central Sri Lanka. With its picturesque countryside scenery, cool mountain climate, rolling hills and colonial villas, Nuwara Eliya has earned itself the nickname of ‘Little England’. It makes a great base for day trips to visit renowned nature attractions and tea plantations located around central Sri Lanka. Enjoy easy access to the a variety of attractions peppered around the city center. Take a stroll through the Hakgala Botanical Gardens to view its well-manicured grounds, which contain over 10,000 species of flora. Lake Gregory, a reservoir set in the heart of the city with views out to the mountains is another attraction ideal for an evening stroll. Visit the Seetha Amman Temple to take in its colourful exterior. Pedro Tea Factory is a must-visit for tea lovers and travellers keen on discovering more about the tea making process. Horton Plains National Park and Adam’s Peak are popular day trip attractions. The former is a key wildlife area home to species like the leopard, sambar and endemic purple-faced langur. A trek across the grounds will take you to renowned sites like Baker’s Falls and the World’s End, a sheer precipice with a jaw-dropping 1,050 metres drop. A hike up to the summit of Adam’s Peak is no easy feat, but is well worth the effort for the spectacular mountain top vistas. It’s an important pilgrim site, and the pilgrimage season begins on poya day in December until the Vesak festival in May.